Katharine S. White, the New Yorker’s first fiction editor — she held the post for 35 years — was also a devoted gardener. (And married to E.B. White, NBD.) In 1958, the magazine published her critical review of garden catalogs. Katharine White wished the seed rack had never been invented. She prized her copy of the 1895 Ferry-Morse company seed annual — a catalog which, she wrote with wist, captured the spirit of a time before glossy color photography and brand-name hybrids made everything more boring. 1895 D.M. Ferry & Co. Seed Annual. Via Archive.org. Not that “Mr. Ferry” wasn’t giving the world plentiful, productive, and practical reasons to grow Ferry seeds. From the company’s test farms in Detroit, and from their massive seed warehouse and fulfillment center on Monroe St., Ferry slowly and steadily changed the way we grow and consume vegetables, fruits, and flowers. The Ferry Co. — at least according to the company’s public relations writers — uncurled the green bean so it would fit better in a canning jar. They smoothed the warts off of the summer squash (but not before introducing some of horticulture’s homeliest warted varieties). They designed the world’s best-selling beets, and thus changed the world, at least for people who love beets. D.M. Ferry Co. Building, 400 Monroe St., Detroit. 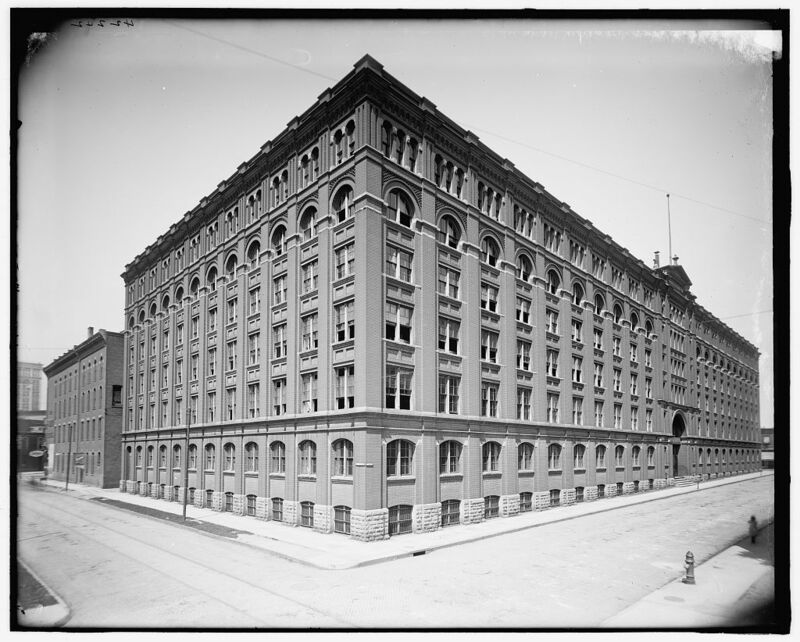 When it was built the Ferry Co. claimed it was “the largest and finest building in the world devoted exclusively to the garden seed business.” Via Library of Congress. It’s garden catalog season, a time for “lists and callow hopefulness,” as Katharine White wrote. But spring is just around the corner. 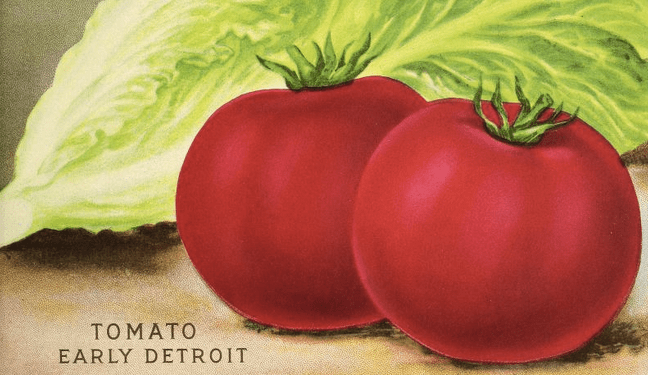 This year, I urge you to grow a few made-in-Detroit favorites — locally-developed commercial heirlooms that elegantly illustrate, in living delicious color, at our dinner tables and in our pickle jars, the marriage of industrial and agricultural might in Detroit in the late-19th century. The D.M. Ferry Co. introduced the Detroit Dark Red, developed from a European “blood turnip,” in 1892. America has been crazy for this beet ever since. 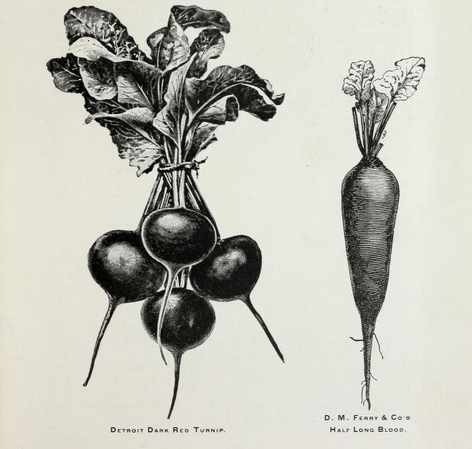 “The greatest pride of Ferry-Morse is the Detroit Dark Red beet, a titan among root crops which was bred 59 years ago and is still the world’s largest selling beet,” wrote LIFE Magazine in a 1951 profile of the Ferry-Morse Company. Seeds available basically anywhere beet seeds are sold, including Ferry-Morse (O.G.!) and Seed Savers Exchange (organic!). Not Blanche Ferrys, but you get the picture. From the D.M. Ferry & Co. 1915 Seed Annual, via Archive.org. 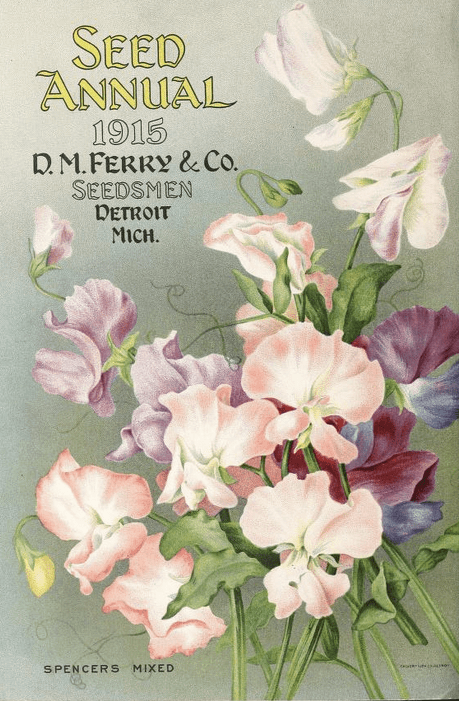 Introduced by the Ferry Company in 1889 and named for Dexter M. Ferry’s daughter, this is the oldest American sweet pea variety. It came onto the scene when English-style gardens were the RAGE. Nothing said THIS IS AN ENGLISH GARDEN like sweet peas. This story about the role the California-based C.C. Morse Company (which merged with the D.M. Ferry company in 1930, creating the Ferry-Morse conglomerate we know today) played in America’s sweet pea fever is a fascinating introduction. I shouted for joy when I found Blanche Ferry seeds listed in this year’s Baker Creek Rare Seeds catalog. You can order them here. 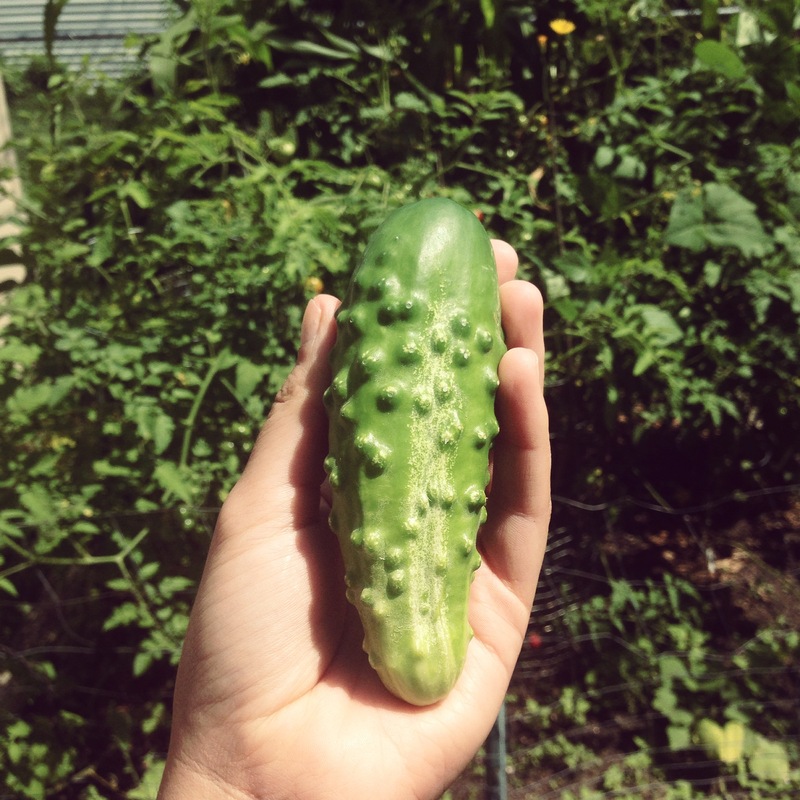 These pickling cucumbers were developed by pickling cucumber expert George Starr, who worked at the Agricultural Experiment Station at Michigan State University. In 1924, Starr estimated that over 36,000 acres of crop land in Michigan were dedicated to the production of pickling cucumbers. There is a good reason for this; the reason is pickles are great. We’ll probably never know how many of of those 36,000 acres produced Early Fortunes, but they were a main-stay variety, and as someone who grew Early Fortunes last year, I can testify that they are pretty much perfect. Seeds available from Baker Creek Seeds or Seed Savers Exchange. George Starr himself can help your home crop of pickling cucumbers flourish; he wrote this bulletin on “Cucumber Culture” in 1926. From the 1924 D.M. 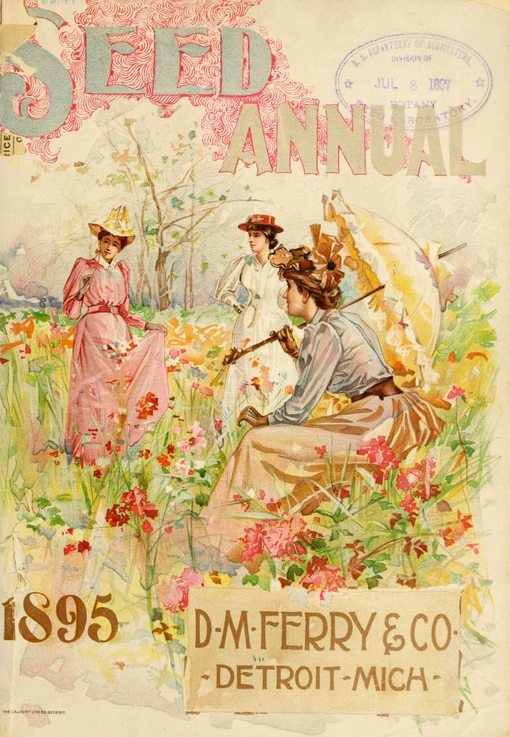 Ferry & Co. seed annual, via Archive.org. Gotta be a Ferry Co. seed with a name like “Early Detroit,” right? Introduced in 1909, this pinkish globe tomato was one of the most popular varieties of market tomatoes in the country. Today the seeds are hard to find, but a few heroic seed sellers are trying to keep this baby alive. Try the Victory Seed Company. THIS SQUASH IS SO UGLY. A squash this ugly has to be SO GOOD, right? I’ve never tasted Hubbard squash before, so I don’t know, though I plan to grow it this year. D.M. Ferry & Co. introduced this duckling in 1898. Seeds available from Baker Creek. If you grow any of these heirloom vegetables or flowers in your garden this year, would you let me know how they turn out? And maybe share a recipe or two? I’ll do the same. Hi! Absolutely loved this post. I’m a WSU graduate student currently researching and trying to create a seed library for the city of Detroit. I’ve stumbled upon so many cool things I didn’t know regarding Ferry and his stake in seeds way back in the day (including this). Thanks for writing this, timing couldn’t be better! Hey Shannon! That is so awesome to hear. A few people have asked if Detroit has a seed library and I haven’t known the answer. I would love to know more about your project and see if there’s a way to help! I’m continuing to research the Ferry Co. and toying with the idea of growing a demonstration garden this season. Drop me an email if you like! – amy elliott bragg at gmail dot com. Just had to let you know how much I enjoy all your posts. You are an excellent writer. Thank you.